CHRISTOPHER CHABRIS and DANIEL SIMONS are cognitive psychologists who have each received accolades for their research on a wide range of topics. Their “Gorillas in Our Midst” study reveals the dark side of our ability to pay attention and has quickly become one of the best-known experiments in all of psychology; it inspired a stage play and was even discussed by characters on C.S.I. Chabris, who received his Ph.D. from Harvard, is a psychology professor at Union College in New York. Simons, who received his Ph.D. from Cornell, is a psychology professor at the University of Illinois. 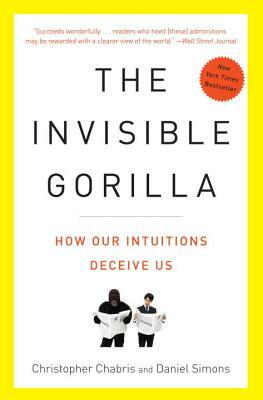 "THE INVISIBLE GORILLA is not just witty and engaging but also insightful. The authors offer a fascinating set of examples that show how poorly we understand the limitations of our own minds in business, medicine, law enforcement, journalism--and everyday life. Reading this book won't cure you of all these limitations, but it will at least help you recognize and compensate for them."